From the aesthetic point of view, the Armor Ulefone has the typical appearance of rugged and very autonomous smartphones (see the Oukitel K10000) with the difference that the model in question, in the lower part, has a plaque with the logo of the company. 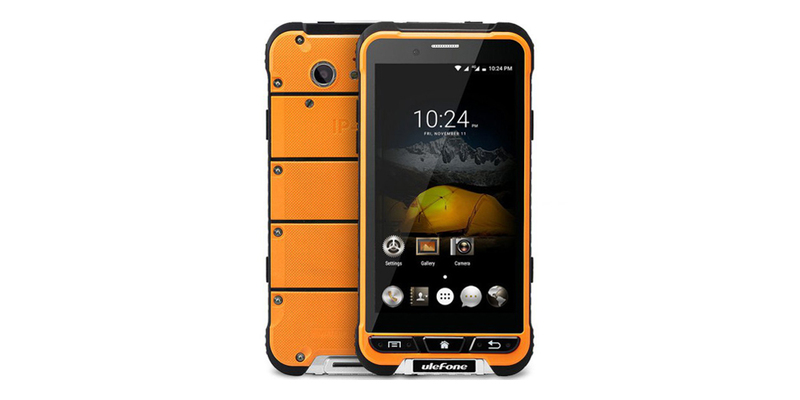 Obviously, it smells to battle-ready technology, and it is not merely a matter of appearance: Ulefone techs have taken a number of precautions to overcome numerous resistance tests, and as the body of a vehicle, for example, it also has protections in the upper and lower corners and consists of a double layer of polycarbonate and TPU, a flexible foam also adopted in some cars to absorb the impacts. The Ulefone Armor is not afraid neither dust nor water, but is also suitable for extreme survival: the temperature range it tolerates come from -20 to +80 degrees, making it an essential companion for extreme climates and for adventure lovers. The Ulefone Armor surface also includes some physical keys, in addition to the classic capacitive touch screen, to allow maximum ease of use even when the user wears gloves or is under water. To promote safety on the road, Ulefone Armor includes an emergency button that searches the phone number of someone you trust and sends at the same time an SMS message with your GPS coordinates to facilitate the task to the relief efforts. The technical specs are not bad at all for a rugged mid-range device: 64-bit chipset, MediaTek 6753 octa-core processor, 3 GB of RAM and 32 GB of storage. The rear camera has 13 megapixels and the built-in battery of 3,500 mAh, ensuring a continuous autonomy over time. The coverage of the international broadband is guaranteed by the presence of 3G and 4G, while the operating system will be in charge of Android Marshmallow. Ulefone Armor seems to be the smartphone tailor made for adventurers, but also for technophiles who want to have a device capable of guaranteeing valid soundness criteria and help in case of need. It is already available in pre-sale at a price of $ 159, and is a good offer considering the specifications.